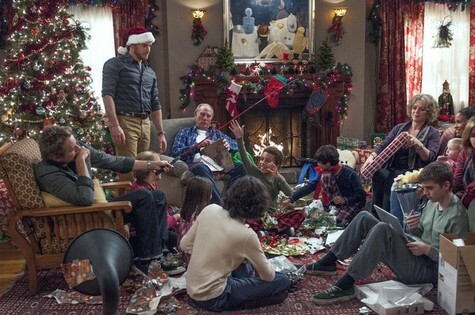 NBC’s popular show PARENTHOOD returns tonight with a whole new episode. Tonight’s eleventh episode of the 4th season is called “What To My Wondering Eyes.” On tonight’s show the holiday incites a mix of emotions as Adam and Kristina experience a health scare while Crosby and Jasmine celebrate their first Christmas together as a family. . If you missed the last episode you can read our full and detailed recap here! On last week’s show Sarah (Lauren Graham) put her energy into helping Hank (Ray Romano) mend his relationship with his family, leaving Mark (Jason Ritter) increasingly impatient with his status in Sarah’s life. Julia (Erika Christensen) was concerned with Victor’s (Xolo Mariduena) frustration with school and sought advice from Kristina (Monica Potter) on how to provide encouragement. Recap: Julia and Joel catch the kids searching the house for hidden presents. Amber is baking cookies with Ryan and he tells her that he just wants to be with her on Christmas. Sarah is staring at a family picture and Zeek tells her that it is great to have her and Drew back just when he walks in and announces that he is going to Amy’s house. Haddie is stuck at the airport, there are no flights going out and Krystina just wants her home so they can have the best Christmas ever. Krystina is coughing and Adam wants to take her to the hospital, she doesn’t want to go. Crosby and Jasmine are reading a Christmas book to Jabar, they tell him that they are going to go cut down their own tree and he is excited. Meanwhile, it is late and Krystina is still coughing, but now she has a fever as well. Adam calls Crosby to watch the kids and all Krystina can think about is that it’s Christmas Eve and she doesn’t want to leave the kids. The next morning, Crosby is trying his best to take care of the kids and Adam tells him not to tell anyone because Krystina is going to be out of the hospital in no time. Amber is visiting Julia and Joel when Julia spills the beans that Ryan broke a window the first day on the job and Joel hasn’t been able to speak to him because he didn’t go back. Max gets home and when he finds out that his parents are not there, he is upset because his dad is not home to take him to the mall. Zeek walks in and wants to know where Adam and Krystina are, Max lets slip that they are in the hospital. Adam is at the hospital when Zeek walks in and Krystina is going through septic shock. The prognosis for Krsytina is good, but there are no guarantees and Adam is really worried. Amber approaches Ryan about the job but he acts unconcerned about the whole thing. Amber wants him to go see Joel and talk it out. Max is at the mall with Crosby and Jasmine and they are both keeping it cool when he wants them to do everything he wants. Meanwhile, Krsytina has woken up and tells Adam that she made a video on her computer for the children and she wants to make sure that they get it. Ryan has been gone for quite a while, Amber keeps calling him and there is no answer. Sarah and Hank are having drinks after a days work and the two are getting closer. Zeek is back at the hospital and apologizes to Adam for being frantic before when he saw Krystina. Hank and Sarah slept together, he says something stupid about being in the right place at the right time, then says they were both drunk and should forget this ever happened. Sarah’s phone is ringing, it’s Zeek and he tells her that Krystina is worse. Meanwhile, Amber is starting to freak out because she hasn’t heard from Ryan and he shows up, drunk. The two get into an argument and Amber is upset because he didn’t go to see Joel and he tells her that she is trying to change her into what she wants. Jasmine is emotional holding Nora and tells Crosby that she wants another baby, to her delight, so does he. Zeek calls the family together to talk to them about how Santa is real, in fact, he says that he actually saw him. He tells everyone a story about when saw him, he swears to God and goes on to say that Christmas is magic and brings miracles. Hank arrives at the door, he brought Sarah something then he tells her that he doesn’t want their relationship to be a one time thing, in fact he feels the opposite and he thinks she is incredible. Adam is at the hospital with Krystina, he has her laptop and plays the video that she made for the children. Amber tells Ryan that she needs a break, she just can’t take what’s going on and needs some time away from him. Krystina is doing so much better, her white cells are coming up and her vitals are better, she tells Adam she feels like a hundred bucks and thanks him for being there for her. The Braverman family are all at the hospital to visit Krystina, fourteen of them and Zeek bribes the head nurse with a gift to get them all in to see Krystina. Haddie made it home for Christmas.